Each of the lambs were found to have serious head wounds, with three having had both of their ears completely ripped off. 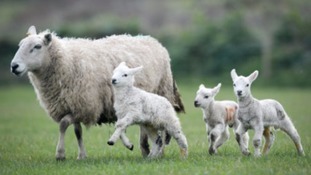 24 lambs have been stolen from a field in the Firbank area of Sedbergh. The lambs are Texel Mule cross and have ear tag numbers UK111871. The lambs were taken between 11am on 16 August and 10am on 17 August 2017. Police investigation and ask anyone with information to call 101 or crimestoppers anonymously on 0800 555 111 referencing incident 66 of 17 August 2017. The farmer says she weighs in at 28lbs - around four times the size of an average newborn lamb.